Sixteen Whose Line performers have been marooned on a remote island. To survive, they must outwit, outplay and outperform each other in various improvisational immunity challenges. Every two days they attend a meeting of the Whoser council, where one contestant will be voted off the island. But in the end, there can be only one - WHOSE LINE SURVIVOR. JEFF: I'm standing here on this boat, and around me sixteen Whose Line celebrities are racing around trying to rapidly get together enough equipment to survive on a desert island for thirty-nine days. TONY: Who's got the twiglets? Who's got the twiglets? RYAN: Look, the prawns don't matter! JEFF: And now, we being an odyssey of unimaginable proportions. Sixteen celebrities must outwit, outthink and outsurvive one another on the island. Who will be... the Survivor? RYAN STILES - actor and part-time tent pole. COLIN MOCHRIE - who hopes that he might be able to signal for help by reflecting the sun off his head. GREG PROOPS - plans to insult the fish into his net. BRAD SHERWOOD - hoping that his second game show appearance will go better than his first. WAYNE BRADY - entertainment for the tribe and may be able to sing the forest creatures to sleep. CHIP ESTEN - Former sitcom star and bartender. KAREN MARUYAMA - Ready and willing to give anything a go on the island. JOSIE LAWRENCE - Comedy-Store player extraordinaire. TONY SLATTERY - Thinks he might be able to get away with more naughty things on the island. JOHN SESSIONS - Hoping to recreate Robinson Crusoe. JIM SWEENEY - Looking forward to being on the island with his friend Steve Steen. STEVE STEEN - Looking forward to being on the island with his friend Jim Sweeney. MIKE MCSHANE - Has been practising marching around for long periods. PAUL MERTON - very practical. Won't put up with any hallucinations or overactive imaginations whatsoever. STEPHEN FROST - Prepared to use his eyebrows if they run out of firewood. JEFF: Each of these tribes will be competing in improv-immunity challenges to see who survives. The team that loses will have to come to the Whoser council, where one of them will be asked to leave the island. BRAD: Then why doesn't he cook the rice himself? JIM: Lovely. Shall I get the spoons? PAUL: What spoons? Where did the spoons come from? Hang on, I'll just get on my moped! JIM: No, there's some spoons in this box over here. PAUL: I know. I was being serious - I left my moped parked just down the beach. GREG: Hey look, there's a message coming through on the World Crisis Monitor! Including one tomorrow, it's for immunity." CHIP: Why did you sing that as a rap? DENNY: It seemed like one. CHIP: Not unless Stephen Fry wrote it. It's clearly a hoedown. STEVE: So we get today off then? MIKE: I would say so. Perhaps we could get the campsite set up then? TONY: Oh my goodness, we're marooned on a desert island... marooned! MIKE: Cut the dramatics.... this isn't El Dorado you know! STEPHEN: There's something coming through to our World Crisis Monitor! And yet it's time for you to sing an hilarious hoedown. The loser is the one who is the first whose verse is crap." JEFF: Okay, here you are at the first immunity challenge. This... is the immunity twiglet. Whoever holds this is safe from the tribal council - stop nibbling it, Tony. Now, you know what the challenge is. Your topic is... Survivor. But I will kill the next person who cooks me f---ing rice..."
Desert island in the summertime. Yeah desert island in the summertime." JEFF: Come on... don't lose it! At least I have an immunity idol, I keep it in my pants. JEFF: Phew... you just made it! It feels... so soft and squeaky clean and... I just like to touch. JEFF: Well... we have our winner. 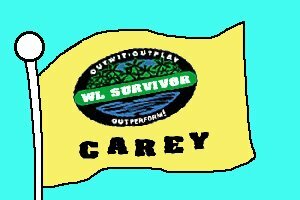 Congratulations Carey tribe, and Clive tribe... I'll see you tonight. 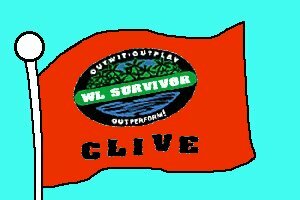 JEFF: Welcome, Clive tribe. Is anyone feeling particularly vulnerable tonight? Paul...? JOSIE: Now, now boys... don't squabble. JEFF: Anyone feeling particularly invulnerable? JIM: I am. I've hardly done anything so nobody noticed I was here. STEVE: Well, now you've blown it. RICHARD: I'm feeling pretty good. RICHARD: Because I'm not in the tribe... seemed like a pretty good tactic at the time. JEFF: Yeah, but you can't win either. JEFF: Well, now we go to the Whoser council for their votes. Ladies and gentlemen, who is the first to leave the island? Is it Josie Lawrence, Tony Slattery, Mike McShane, John Sessions, Steve Steen, Jim Sweeney, Stephen Frost or Paul Merton?